One gardener's observations, discoveries and random thoughts whilst simultaneously worshipping and dallying in a Cape Cod garden. "A garden," said Ralph Waldo Emerson, "is like those pernicious machineries which catch a man's coatskirt or his hand, and draw in his arm, his leg and his whole body to irresistable destruction." Outside the dining room window is this wonderful Andromeda bush...tree...thing. The "feet" of this behemoth appear in the upper left corner of this photo. It's as high as the eaves, and quite lovely with its off season blooms of white bell clusters (just forming now). 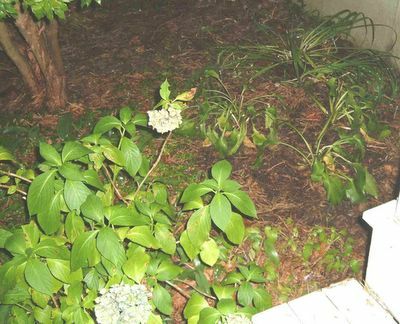 Around the base of it is a nice established plot of vinca, with a hydrangea by the step and an assortment of lily of the valley appearing throughout. But just off the porch was a large empty place, where this evening I added a trio of honeybell hostas, backed by a trio of yellow daylilies. 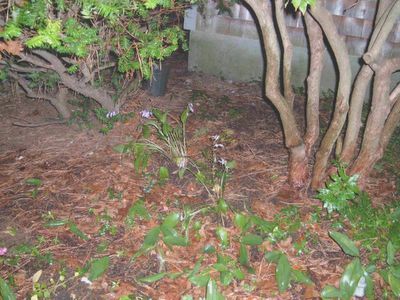 On the other side of the andromeda, I've begun adding a semicircle of smaller hostas, which will spread around in front of the adjacent evergreen shrub, and serve as a backdrop for a bed of impatiens, as I planted this year. Behind these first hostas, (between the "feet" of the two bushes) I've also transplanted some ferns from the back garden, at this time of year a bit battered and hard to see in this photo. Of course the best part is imagining what it will look like next year...and five years from now. This is the time of year to be re-imagining, to be directing next summer's stage show. There's lots of transplanting and re-arranging I'll be hoping to do in the next couple of days, as we are forecast to be receiving the (hopefully faded) remnants of Hurricane Ophelia...and a good soaking rain will be just the follow-up to a change in location. My site deals with mlm. I know, that's totally unrelated but was scanning the blogs today. A real enlightening blog. Don't stop now. This may be of interest to you; how to buy & sell everything, like music on interest free credit; pay whenever you want.